“Collegiate athlete Lily Brennon has always been the piece that doesn’t quite fit in the puzzle, especially in her fragmented family, and no amount of rule-following perfection seems to bring her any closer to the love and acceptance she desperately seeks. If not for Jackson Carter, her childhood best friend and the only boy she’s ever loved, she’s sure she would have run away years ago. But when Jackson loses his father and a future basketball career within months of each other, his faith is so shattered, he shuts out everyone, including Lily. Alex caught the flush in Lily’s cheeks as she smiled at Steve, and he took a quick glance at his partner. Steve was the nicest guy he’d ever met. Too nice. And he wasn’t about to let some snobby chick get the wrong idea about him. Besides, no matter how nice he was, even Steve could be tempted by a hot girl, and he had to admit this one was a looker. Her legs had caught his attention first—long, athletic—but it was her eyes that he kept coming back to. They were cool and aloof, wandering over everything in the park, except him. He could tell from the moment she walked over that she’d rather be anywhere else. Until now. He’d have to nip the flirting before she mistook Steve’s goofy grin for something more than friendly conversation. Steve looked up at the stars as if he expected the answer to be spelled out as a connect-the dots puzzle. The younger two dove into questions about the wedding, though Steve never seemed to give good enough answers. Lily hung back, of course, her eyes drifting down the beach. She crossed her arms over her chest and shifted her weight back and forth like she couldn’t wait to get out of there. The lights of the ice cream parlor across the parking lot went dark, and she looked down at her watch with visible relief. Thanks to Jennifer Westall and RABT Tours for hosting the blog tour and letting us post this awesome excerpt! 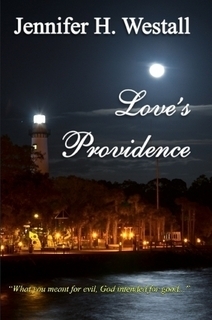 For more about Love's Providence check out these sites!